This bamboo tray has a history. This was one of the 64 custom made trays Maa used to send Kone tatto(wedding gifts from bride's side) on my wedding. Many guests took one of these home for various household work. Spotted this at some forgotten corner of my in law's space last week. Brought back a piece of memory. Have you ever thought of life without electricity? Which means no Fan, no light, no a/c no Fridge…Nightmarish right? But many villages in India still live that nightmare day and night. not even very long back that most of the Indian villages dint have electricity. We find it tough to deal with this fact because we have grown up with this facility. But when you don’t have it you find and devise your own way to deal with it. My mamabari (maternal uncle’s home) is in a small village in the coastal area. Like everyone of you we loved spending our summer vacation there with grand parents and many sets of cousins. Though we were used to have electrical devices around us but we never seemed to miss it while spending time there. Every evening Mamima (Aunt) will take out all the hurricane lights and kerosene lamps to clean with a damp cloth. Later those would be lit for various household works and playing ludo before dinner. Often Dadu will bring dark green thick skinned water melons for our late afternoon get together in the verandah. My cousin brother will put the melon in a big polythene bag and will bury it in the sticky mud on the pond bank. The water will touch the mud on the melon and will make it cold and refreshing to wake us up from our afternoon siesta. Any left over food was reheated and placed on a hanging rack or in the net covered cupboard. So that the fresh air circulate on the food to keep it fresh for the next day. As summer beverage Dida used to make many a variety of drinks which not only cooled the body but also was very good for health. Apart from lebu’r sharbot (lemonade) and aam pora sharbot (raw mango drink) she used to make drinks made from various roots (like shilajit), palo, Barley flour all of which had cooling and detoxifying properties. For stomach problems she often served us drink made from cold rice water (not the fermented toddy but drink made from water in which rice is soaked overnight). 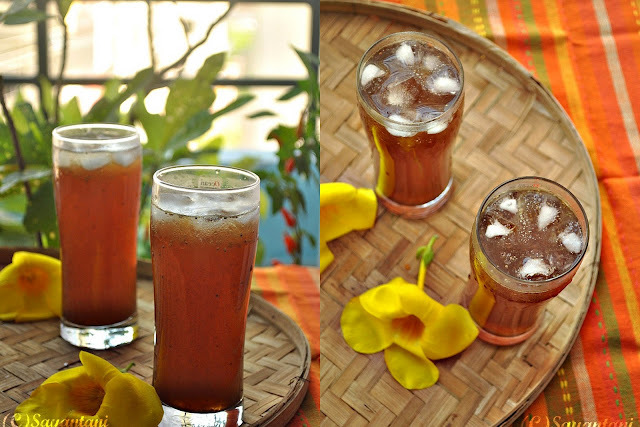 This tentul or tamarind drink was her medicine for people suffering from dysentery. We Bengalis believe purono tentul or preserved old tamarind is very good for digestion and dysentery and in many households including mine tamarind is preserved with generous sprinkle of salt every year. Tentul or imli or tamarind according to Ayurveda is antimicrobial and is very good to treat gastric and/or digestion problems, and in cardioprotective activity. Please check this for its further benefits. As I understand giving out recipe involving tamarind is very difficult. Its all about balancing all the tastes. So depending on the tartness of the tamarind and your taste preference adjust the amount of sugar. Here I am writing down what I did. 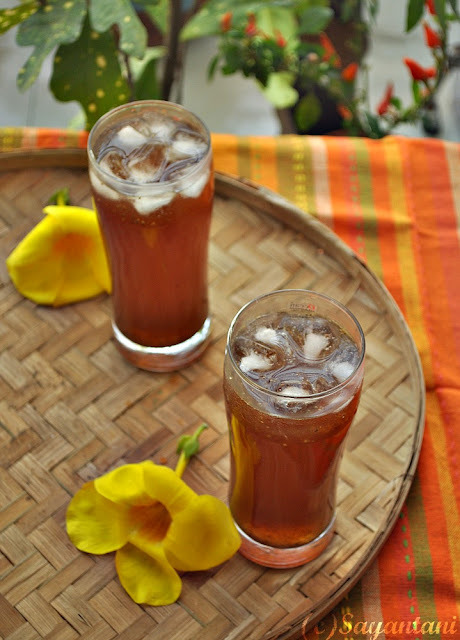 Though my maa never made this drink but the Kolkata summer made me remember this refreshing drink. Its basically sweet but has a light sour taste that makes it special. When drunk with plenty of ice it will make you forget the heat or sweat. Trust me its kinda addictive. Generally this is made with misri or sugar crystals or rock sugar, which again is considered to be very cooling for the body. I used white rock candy but if its unavailable you can also use any kind of sugar. Bhaja masala: 1/3 tsp (click on the link for bhaja masala recipe) or substitute with dry roasted cumin powder. In a big bowl soak the tamarind with the water and rock sugar. Cover and let the rock sugar dissolve. Approx. ½ an hour. Then squeeze the tamarind and take out all the pulp. Mix well and strain. Let it stand for another 10-15 minutes or till the fine bits of the tamarind settles at the bottom. Now without disturbing the bits pour the clear water from the top. Heat the oil and crackle the mustard seeds and dry chili in it. Pour in the tamarind water and immediately cover. Once the splattering sound stops remove the cover and add the salt and bhaja masala. Bring to a boil and simmer for 2 minutes. Taste and adjust the seasoning as per your taste. Mine was sweet enough so I dint add any more sugar. Feel free to add more sugar or salt. Switch of the flame and let it come to room temparature. You can strain the water now if needed. Chill in the fridge. To serve fill 1/3 of a tall glass with ice and pour the sharbot. to Kitchen Chronicles; heirloom recipe originally started by kalyani. Tickling palates lets cook; chilled delights. 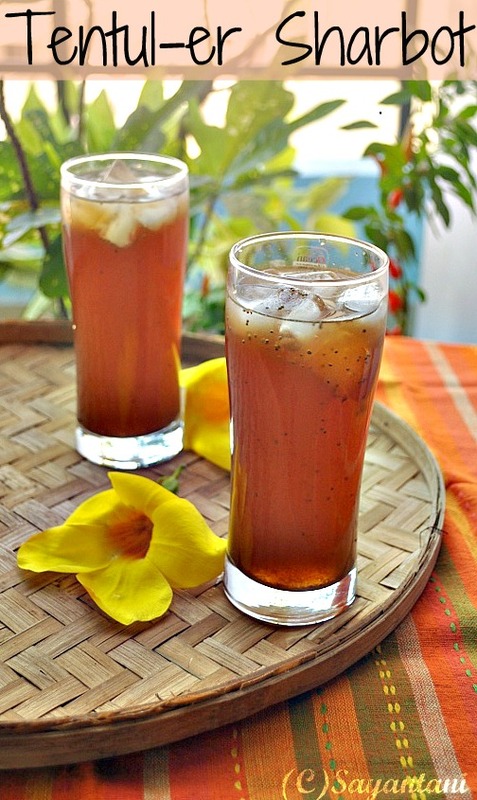 summer beverage, summer drink recipe, best summer drink, summer drink recipes, non-alcoholic summer drink, no alcohol drink recipe, imli drink recipe, beverage recipe, refreshing summer beverage recipe, easy summer beverage recipe, tamarind based cooling drink, cooling summer recipe, drink, drink recipe, drink for dysentry, tentul shorbot, sherbet recipe, sharbot recipe, how to make tamarind drink, ezyptian tamarind drink, middle eastern drink recipe, Indian summer beverage, bengali cooling beverage recipe.sweet and sour drink recipe, drink with bhaja masala, spicy summer drink. Hi. Loved reading your childhood memoirs :). This is completely new for me and it does sound different and refreshing. Nice clicks. Lovely! At first it looked like ice tea. A spicy sweet drink is just my kinda thing. Am going to make this in a big batch as the summers in Mumbai demand it. We already consumed 4 litres of kokum syrup this year. We call it Imli ka panna . Very cooling and yummy. There is one made using mint leaves and raw green tamarind, I don't see any green tamarind in markets now a days. I bought a similar bamboo tray from trade fair last year. 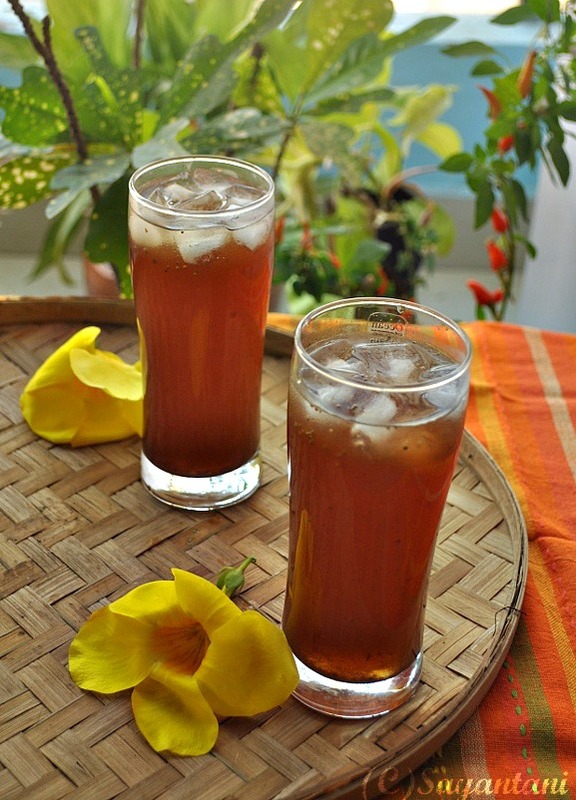 @Sangeeta, I would love to see the green tamarind drink. wish you were nearby could have send you some green tamarind from Mamu's backyard. @Anjali, yes kokum drink (sol kadhi?) is in my to do list for a longest time but now am outta south and no kokum here. make it the sweet n sour drink will get you hooked. @Turmeric. let me know how it turns out. Omg, super refreshing drink...wat a eye pleasing clicks.. The drink does look very refreshing. I never tasted tamarind sharbat. I'm loving the sound of this! Is bhaja masala available in the stores, or do you have to make it at home? @Nash, the recipe of the bhaja masala is given in the link. or you can substitute it with dry roasted cumin powder. Thats similar to Imli ka Panna.. very refreshing , and what a treat to eyes with this lovely click..
@Nupur, thats the only flower i get in our society garden. This is one of my favorite drinks..we make it similar way but without the tadka thing..lovely clicks Sayantani. YUM - I can imagine it tastes GREAT!!!! Ah! Dear - that was the next recipe I was going to try with these flowers :) will surely you know when i post! Wow! that drink looks so refreshing! This is my first time here and i'm loving it, and your pictures! I agree, photography is an art, and no matter how hard i try, lovely pics are so elusive! :P. I'm a sucker for tamarind. and the Bhaja masala sounds very fascinating! Can be used for a variety of stuff am assuming... Thanks for sharing Sayantani! Sound interesting and new to me and love the way you narrated and kudos to your click. Thanks for linking this tangy refreshing drink to the event. This is something for new to me and looks so freshing! your pics are fab! wow that looks like such a yummy cooling drink..i think i can imagine it to taste bit similar to imli chutney(sweet and tangy)...anything near to it?